Karim Magdi's smile beamed as he indulged in the delicacies of the day. "I am a big fan of sweets, especially ice cream, and today is a day of pleasure," he told Ahram Online. Magdi was one of the attendees at The Chocolate Festival, which was held on 4 October for two days at one of the famous Italian ice cream stores in Zamalek district; Gelato Mio. 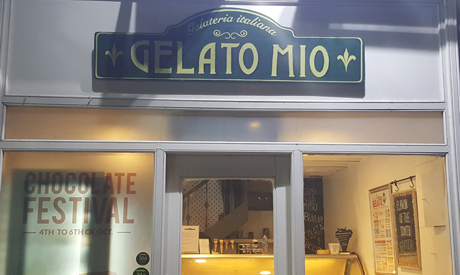 Gelato Mio means “my ice cream” in Italian. Gelato, which is very popular in Italy, is not exactly the same as ice cream. The founders of the store, who are Egyptian-Italian, opened the shop at the end of 2014. “The concept of the store is based on the classic, traditional way of making ice cream in Italy,” El-Kastawy said, adding that the store holds different festivals in rotation throughout the whole year. “We have different portfolios, including festivals for chocolate and coffee, cheesecake and berries,” El-Kastawy said. The festival offered a wide range of chocolate flavours to satisfy all tastes, including Gianduja, one of the greatest Italian chocolate flavours from northern Italy. Gianduja is chocolate paste flavoured with ground hazelnuts. Along with Gelatos, the festival offered many varieties of ice cream cakes. An Italian woman, Liza from northern Italy, told Ahram Online that the festival brings a dash of nostalgia. “Gianduja flavour is my favourite. It always reminded me of my homeland, "she said. El-Kastawy takes pride in the fact that the festival provides the widest range of flavours in Cairo. "Everything is made on a daily basis at the store to ensure its freshness and sweet taste. All products are natural and free of preservatives and artificial colouring and flavours,” El-Kastawy added.